Spencer Living Room Table Collection by Standard Furniture have clean transitional styling and smoothly rounded shapes to fit in perfectly with today's sophisticated yet relaxed lifestyle. The Spencer Occasional Collection brings a sophisticated yet relaxed presence into your home. 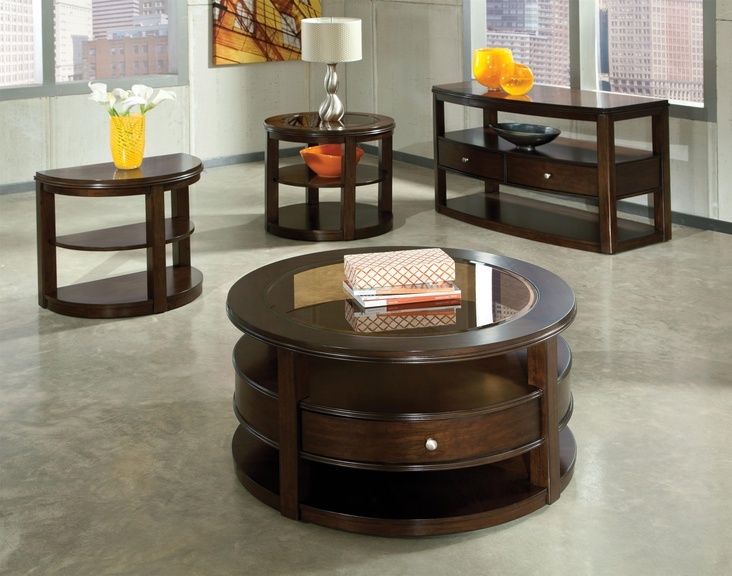 Featuring a beautiful transitional styling, it is crafted from poplar solids and cherry veneers in a rich brown finish. Plentiful storage space is provided with shelving and drawers. Design details include double beaded accent moldings, reverse diamond pattern veneers on shelf surfaces, and pretty smoky bronze tint beveled glass tops. Perfect for today's home, Spencer adds a splash of style and comfort to any living space.